Mother's Day is Sunday! Thankfully, Wendy Elsasser, who spent 22 years as a floral designer for the White House, gives a quick and dirty guide on how to buy the perfect bouquet for mom. You still have time! Mother's Day is Sunday! Thankfully, Wendy Elsasser, who spent 22 years as a floral designer for the White House, spoke to Kristen Philipkoski for The Wirecutter and gave a quick and dirty guide on how to buy the perfect bouquet for mom. You still have time! Ordering flowers for Mothers Day seems so predictable. Getting a delivery of a dozen roses might be pretty enough, but it can also seem like you didn't put a whole lot of thought into your gift. It doesn't have to be that way! To find the optimal Mother's Day floral arrangement, we got in touch with Wendy Elsasser, who was a floral designer at the White House for 22 years. She helped create floral works of art for Nancy Reagan and Barbara Bush. Her flowers festooned the tables of some of the most imporant diplomats in political history, so we figured she was qualified to advise us on Mother's Day blooms. 1. Cost: We'll start here since the price dictates what flowers and vase you'll be getting. Elsasser says $75 is a good amount for creating a beautiful arrangement that everyone will be happy with. 2. 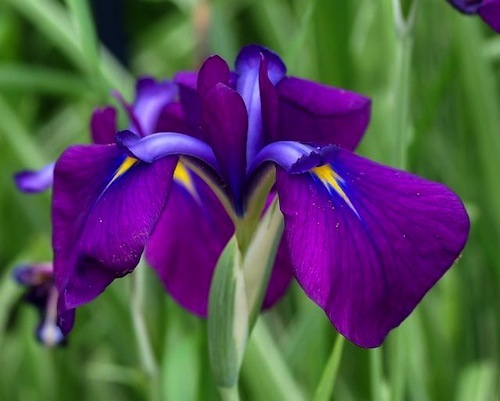 Main flower: Iris. It's a mom favorite, and they are typically available in mid-May. Also, it's not a rose! Nothing against roses, but, Elsasser says, "So many flowers today are available other than roses. It has a lot to do with Martha Stewart–she helped popularize flowers that used to be known as just garden flowers. And we can thank her for that!" If for some reason irises are not available in your area for Mother's Day, consider hydrangeas, peonies, lillies, freesia or any flowers imported from Holland, including tulips and amaryllis. "These imports from Holland are done weekly and they're just gorgeous," Elsasser says. "They last a long time; they are experts in knowing when to cut the flowers." 3. 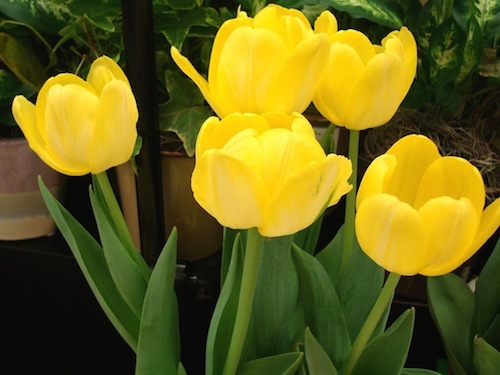 The accent flower: Yellow tulips. They look amazing with irises becasue the purple flower's center is yellow and their edges are blue. And nothing says springtime like a tulip. 4. The vase: for $75, most services will deliver your vase in a lovely silver French flower pail, which is neutral enough that mom can reuse it to store garden tools or fill it with more flowers. But if your mother is of the fancier ilk, go with an elegant crystal vessel. The big online flower outlets, like 1800Flowers and FTD have various versions of the iris and tulip combination, and here's one with yellow roses. But to get exactly what you want, you're best off calling up a local florist and describing precisely what you have in mind–you're also more likely that way to get a great vase. And if the iris plus yellow tulip mix just isn't available, Elsasser recommends finding a florist with a great reputation or someone you've trusted before, and let them create something gorgeous using whatever blooms are in season. "You'll get more for your money if you leave it up to me. The florist tends to give customers more when the choices are left up to he florist." This story was originally published by The Wirecutter, a list of great technology.